Crazy About Clouseau & The Pink Panther? As I sit down to write this I'm reminded of Jack Black's Stevie Wonder related query in High Fidelity when he ponders: "Sub-question: is it in fact unfair to criticize a formerly great artist for his latter day sins; is it better to burn out or fade away?" With Steve Martin... I'm not really sure what to think other than beginning to fear he's become so out of touch with reality that he's the only one who thinks these recent films he's made are funny. Furthermore, I'm struck by an even more horrifying question-- namely, for the guy who once upon a time just wanted to make us laugh--has integrity finally just vanished completely and box office greed taken over in its place? Like the infamous "Black Sox" scandal following the 1919 World Series which found the heartbroken little boy famously asking Shoeless Joe Jackson to "say it ain't so," I'd like to give Martin the benefit of the doubt. But then again when he confesses with a straight face on the Blu-ray of Pink Panther 2 that "it turned out even better than I'd hoped for," I'm at a total loss. Why would one of my favorite comedic idols with: a Mensa level IQ, a degree in philosophy who is also an accomplished banjo player, a quintessential "wild and crazy guy," author of the brilliantly witty Pure Drivel, and a highbrow art collector who has created and starred in some of the funniest films of our generation not only needlessly crib from the incomparable Peter Sellers? Yet he does so in taking on the genius creation of Inspector Clouseau in the Blake Edwards' Pink Panther movies for an awful 2006 remake and returning once again in 2009 for a sequel to a film that critics and audiences alike mostly couldn't stand? While of course I've watched enough crime shows to learn that your first instinct is always the one you go with so I'm simply going to cite the money but even with that excuse I'm wondering just where exactly the films make money? It definitely isn't in the United States where Pink Panther 2 opened and closed within the span of what felt like a week following abysmal reviews so I can only guess that the press release may indeed be accurate when the first film is referred to as a "worldwide hit." Therefore, maybe Panther is funnier in subtitles or when dubbed making Steve Martin's recent comedic phase sort of like Jerry Lewis who's worshiped in France as though he were Chanel... or maybe just like with The Da Vinci Code and Angels and Demons' popularity overseas, Europeans welcome some of the films that just don't strike a chord over here. And international public relations is not only the key to the film as a "product" but also the bulk of its screenplay (which was given a polish by City Slickers and Fever Pitch writers Lowell Ganz and Babaloo Mandel) which was augmented by the decision to widen its net to cast the most globally diverse and popular stars as the filmmakers could find. Not only a great marketing ploy to then drum up support in the actors' home countries but also to add to its ridiculously impressive roster of performers that gives a second meaning to the film's new group of detectives dubbed "The Dream Team." The team are hired to find the world's most treasured artifacts (including the Pink Panther diamond, the Shroud of Turin and the Magna Carta etc.) after they were all snagged by the elusive thief, The Tornado. 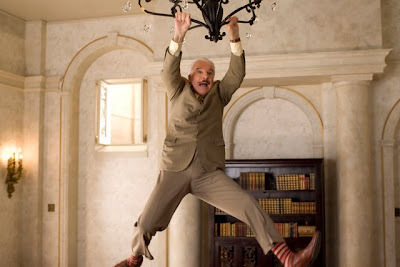 Although Kevin Kline-- possibly taking a cue from Bill Murray who was smart enough to jump ship and bow out of the second Charlie's Angels movie-- has left the cast, his Fish Called Wanda co-star John Cleese takes his place as Clouseau's superior. However when you take into consideration that one of his earliest big on-screen moments is literally banging his head against a wall, you wonder if deep down even John Cleese wondered just what the hell he was doing there. 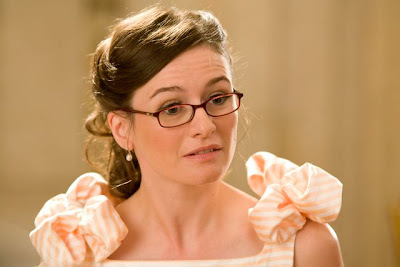 With the adorable, bookish colleague Nicole (Emily Mortimer) setting off sparks with Closeau that neither one can put into words-- their faux romantic relationship is tested as other colleagues fly in such as the drop-dead gorgeous Aishwarya Rai (Bride and Prejudice) who has an only-in-the-movies schoolgirl crush on Clouseau. Likewise, the Cuban-American Andy Garcia throws a wrench into the relationship playing a seductive Italian who decides that Nicole is just the type of woman he'd like to "make-a the babies with... lots and lots of babies... all day long with the babies." In a great moment of in-joke humor as Martin's Clouseau refers to Garcia as Don Corleone-- I couldn't help remembering that yes, although Garcia did star in Godfather Part III, even that film was more welcome than this one because it closed the trilogy's story and had a purpose. Yet, Garcia who also starred in the Ocean's Eleven movies seems to have no problem disappearing into lackluster ensemble projects even though he deserves much better. Rounding out the cast we find a Japanese computer expert played by Yuki Matsuzaki (thus, of course prompting Clouseau to go thirty years in the past to the previous films to call him his "little yellow friend") and the always reliable Jean Reno as Clouseau's best friend. Also signing on, Jeremy Irons arrives as a suspect (naturally) and Lily Tomlin appears as an enforcer of political correctness who we view as all too eager to reunite with her All of Me star twenty years later even in something as misguided as this film. Perhaps the best addition to the group is in the form of Alfred Molina who gets the best scene as he and Martin's Clouseau try to out deduce one another by sizing each other up using their skills as inspectors in an increasingly funny intellectual showdown. 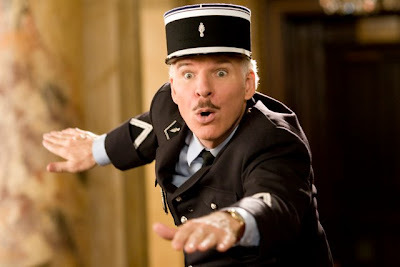 However, the script pushes barbs to the background and physical humor to the foreground as mostly the wondrous cast is left with little to do other than to try to cover for the clumsy Clouseau as he falls down a chimney or off the Pope's balcony while dressed as the Pope or just react to his escalating physical gags over the course of the movie. 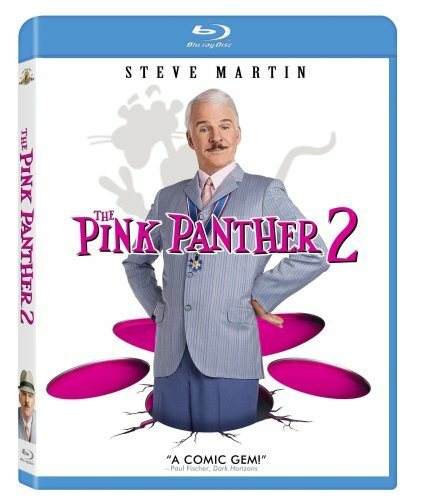 Slapstick and physical comedy are all ramped up to the extreme in Pink Panther 2 as we note in one of the Blu-ray's extra features when it's revealed that Martin did about eighty percent of his own stunts but there were always two doubles around for the most dangerous ones. However, aside from the aforementioned back-and-forth one-upmanship exchange with Molina-- it's Martin's willingness to go back into his classic comedy skill arsenal and ability to juggle that helped win me over in the film's second worthwhile scene (aka the only other time I genuinely laughed aloud-- making that two chuckles in 92 minutes which was two more than in the original film). As he and Nicole push the boundaries of their professional relationship over a romantic dinner in Rome, Clouseau decides to select the perfect bottle of wine as inevitably they come tumbling out and bottles are tossed and juggled to perfection until the restaurant goes up in flames. And it's in this scene especially where I felt that genuine credit was owed to Martin to get in there and go for the laughs with close-ups rather than sit on the side-lines and just count the money (which no doubt he did later) but two successful jokes in a film's running time is hardly a success overall. In fact, the more enjoyable experience was definitely to be found reading the reviews of the work-- which ranged from scathing to hilarious. Peter Hartlaub of the San Francisco Chronicle had the best opener yet when he wrote, "One can only hope that something good is coming from all the bad movies that Steve Martin has been appearing in. I keep waiting for Martin, Robin Williams and Ice Cube to announce that they've used all the proceeds from their unfunny comedies to cure cancer." While I would also add Martin's Bowfinger star Eddie Murphy and The Love Guru's Mike Myers to that list of comedy offenders, Hartlaub has a point regarding all the wasted money, wasted resources, and wasted talent. And replacing the second walk-out in the form of the 2006 director Shawn Levy (who's since moved onto helming the financially lucrative Night at the Museum franchise with Ben Stiller), Netherlands native Harald Zwart's decision to make the jokes bigger and faster in the second one helped ensure that it was more cartoonish and kid friendly than the first. It's most likely a skill he acquired directing Agent Cody Banks before moving onto (sigh) the needless remake of Karate Kid called Kung Fu Kid slated for 2010. While per usual for the exceptional quality of Fox Blu-ray discs-- once again the wizards working in their technical department manage to make this one sound theatre-level and sparkle in clarity as much as the famous diamond and the breathtaking Aishwarya Rai. And given the extra features, we're able to see at least how much work went into the film and appreciate it on that level. Although in certain behind-the-scenes inclusions including the gag reel which-- despite being mostly unfunny-- did result in three laughs from me as opposed to the film's two, making me sadly note that like Garcia's Ocean's movies, the Panther works are only fun if you're on the set and not if you're at home viewing them. Luckily, Fox knew that this time-- given the poor product-- they'd have to do more than just deliver another breathtaking transfer so in addition to a digital copy file, there's a third disc in the set that boasts 27 classic Pink Panther MGM cartoons including the Oscar winning Animated short "The Pink Phink" which-- clocking in at nearly three hours-- are infinitely more enjoyable than Pink Panther 2, the feature.